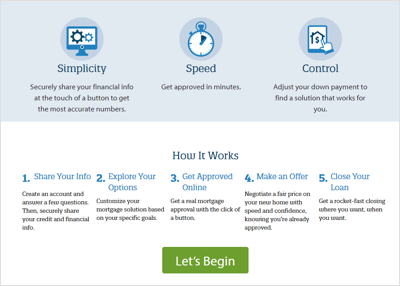 Rocket Mortgage launched in 2015 as the face of Quicken Loans’ online mortgage application. It has its own website and landing page, but has the same underwriting standards as Quicken Loans. The main draw of Rocket Mortgage is that the entire mortgage process takes place online. Customers can complete the application without speaking to a single service representative. However, the option to speak to a representative is available. Headquartered in Detroit, Michigan, Quicken Loans is the largest online mortgage lender, according to National Mortgage News. Founded in 1985, the company has grown to originating 512,309 loans in 2015 alone. Total loan volume was $74,636,124,000 in 2015, according to the Consumer Financial Protection Bureau. While Rocket Mortgage is marketed as an online-only service, with the option to call or chat online if you choose, you can also apply for a mortgage from Quicken Loans directly. Just like Rocket Mortgage, the process is done remotely, but relies more on phone if you choose this option. What sets Quicken and Rocket Mortgage apart from the competition is “YOURgage,” a feature which allows you to pick your mortgage term for a fixed-rate loan. This unique product allows you to choose a term from eight to 30 years, whatever works best for you. When you apply for a loan, you can see how your payments would change if you adjust term, rate or closing costs. Does Rocket Mortgage Operate in My Area? Rocket Mortgage is licensed in all 50 states. It’s the online application section of Quicken Loans, and does not have any physical locations. What Kind of Mortgage Can I Get With Rocket Mortgage? You can generally apply for all the same loans offered by Quicken through Rocket Mortgage’s online application system. Fixed-rate mortgage: This popular mortgage type locks in your interest rate for the entire life of the loan. This means your monthly principal and interest payment stays the same, which many find useful for budgeting and planning. You will find the standard 15-year and 30-year fixed-rate mortgage options. This is also the type of loan YOURgage uses, but with adjustable terms. Adjustable-rate mortgage: This type of mortgage, the ARM, does just what the name suggests: adjusts the interest rate. When you reach the end of your initial fixed-rate term, your interest will go up or down (also known as adjusting) once per year. You’ll find five-year or seven-year ARMs at Quicken and Rocket. Federal Housing Administration (FHA) loan: An FHA loan helps those with limited down payment funds and lower credit scores qualify for a home loan. Quicken states that credit scores as low as 580 may qualify for a loan, but it will depend on your situation. Your options include 30-, 25-, 20- and 15-year fixed-rate terms as well as five-year ARMs. If you qualify, you can buy a home with as little as 3.5% down. Veteran Affairs loans: The VA backs these loans for qualified veterans and active duty service members. Rocket Mortgage offers 30-, 20- and 15-year fixed-rate loans as well as five-year ARM VA loans. You can also find jumbo VA loans at Quicken. Some of the benefits of this type of loan include no down payment or monthly private mortgage insurance. Jumbo loan: While Quicken offers jumbo loans, you may have to speak with a representative at Rocket Mortgage to see if you qualify for this type of loan. Jumbo loans are for mortgages that exceed the conforming loan limit in the area you plan to buy in. You’ll need at least a 700 credit score to qualify, as well as a decent debt-to-income ratio. Loans be as high at $3,000,000 for qualified customers. Refinance: Rocket Mortgage has refinancing options whether you’re looking for a conventional refinance or a government program such as HARP. 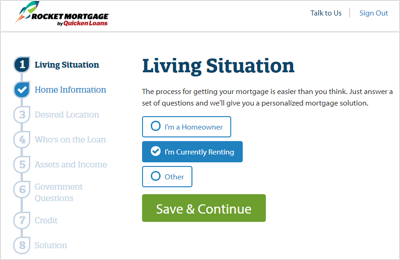 YOURgage: Quicken’s option to customize your loan can also be done on Rocket Mortgage. You choose your fixed-rate loan conventional loan term, anywhere from eight and 30 years, to suit your financial situation. You can also pay as little down at 3%. With YOURgage, you also have the option to refinance up to 97% of your home value. 1% Down Payment Option - This option can be only to purchase a home, not for a refinance. The home must be a single-unit primary residences. This means second homes or investment properties are excluded from qualifying. You’ll need a FICO score of at least 680, and your income must be less than the area median for your county. As for other financial qualifiers, your debt-to-income ratio cannot exceed 45%. It’s unclear whether you’ll see this option through Rocket Mortgage’s interface, so if you’re interested, it’s worth giving the company a call. What Can You Do Online With Rocket Mortgage? You can do everything online with Rocket Mortgage — that’s the basis behind its creation. Back in 2015 during its release, Quicken explained, “we’re obsessed with finding a better way to help our clients get a mortgage. That’s why we build Rocket Mortgage, a completely online, self-service mortgage experience.” That said, you can still talk to a home loan expert by phone or via online chat at any time in the process. The online process starts with the application for initial mortgage approval, which as advertised, takes minutes. After that, you can start the full application process and home-buying process which takes longer. How long from approval to mortgage close depends on your financial situation as well as home-related factors such as the appraisal. You can provide all the necessary financial documentation through the online interface called MyQL. Through this portal, you can access the status of your loan 24/7. For updates on the go, you can download the MyQL app for Android or Apple users. Would You Qualify for a Mortgage From Rocket Mortgage? Rocket Mortgage looks at a number of factors to determine what loan products you qualify for. FHA loans have the lowest minimum credit score, at 580. Most conventional loans will require a score in the good credit range, or better. You’ll find the lowest rates and most reasonable terms will be available to those with higher credit scores. This is one of the reasons most lenders urge homebuyers to improve credit scores prior to applying for a loan. It saves you a significant amount of money over the course of a mortgage. Another factor that’s considered is your debt-to-income ratio. This is your total monthly debt compared to your total monthly income. It’s looked at to determine whether you can afford a monthly mortgage payment. Car payments, student loans, credit card debt and child support all fall under debt that’ll come under consideration. You can find your percentage by calculating your monthly liabilities and dividing by your gross (pre-tax) monthly income. While Quicken’s 1% down payment states that you can have a 45% ratio and still qualify, that’s more of an exception to the rule than anything. That program comes with other stipulations, such as a 680 credit score and income maximum. For the majority of customers applying for loans, the lower the better to qualify for a conventional mortgage. Down payment savings is another factor for loan qualification. The norm is 20% of the home purchase price, but certain programs, such as VA loans and FHA loans come with low or no down payment requirement. For those who don’t qualify for a government-backed mortgage loan, you’ll need private mortgage insurance if you put less than 20% down. What’s the Process for Getting a Mortgage With Rocket Mortgage? The first step is setting up an account on Rocket Mortgage’s website. After that, you’ll answer a number of questions about where you live, where you want to buy, who will be on the loan with you and your financial information. This includes employment history and salary. Your assets and income are required as well as your Social Security number for a credit check. Rocket Mortgage integrates with most banks so you’ll be able to log in to your bank account directly through the system if you want to verify your assets using the quickest method available. When you’ve finished entering the required information, you’ll see a countdown. After a few minutes or so, Rocket Mortgage will display which loans you qualify for. This could include fixed-rate or adjustable-rate mortgages, or specialized loans such as VA or FHA. There’s a slider bar that can help you see what happens if you change the loan term, interest rate or closing costs. If you find an option that suits your needs, you can lock your rate in and send your application for approval. Rocket advertises that you’ll find out if you’re approved within minutes. 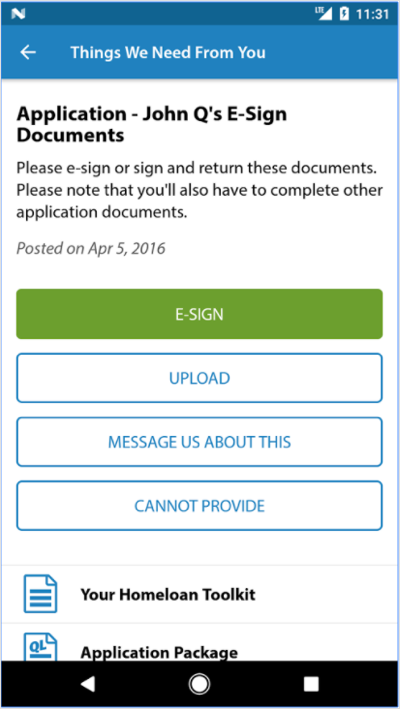 If you are, you can print out an approval letter to help prove your intent to purchase to a realtor. When you have a purchase contract to buy a home, you’ll work with Rocket Mortgage to finalize the loan. That includes setting up a closing date and moving forward with the house-centric portion of the home-buying process, such as the appraisal and home inspection. Quicken Loans, which powers Rocket Mortgage, is the overall largest online retail mortgage lender. With that size comes a number of mortgage and refinance options that help homebuyers with low credit scores or low income. That’s advantageous if you’re looking for a company with a wide range of loan options. You can also find specialized loans such as VA and FHA, which are great options for certain customers. Compared to its online competitors, such as Better.com, a mortgage startup, Rocket Mortgage has some of the most diverse offerings. For example, Better.com, while offering online preapproval and loan applications, doesn’t offer FHA, VA or USDA loans. That means if you don’t have a excellent credit score, or are looking to use government loan options, you’re out of luck. However, Rocket Mortgage doesn’t look as good when compared to a full retail bank, such as SunTrust or PNC (which both offer online applications). These banks offer checking, savings and retirement products alongside mortgages, which is attractive if you’re trying to keep all your finances in one spot. Additionally, many big banks include home equity loans and home equity lines of credit (HELOCs) as customer options, which Rocket Mortgage and Quicken Loans doesn’t offer. Finally, although a representative stated that Quicken Loans is starting to offer USDA loans, you won’t find that option on Rocket Mortgage. Rural homebuyers will have to look elsewhere for that product offering. While interest rates might seem like the most pressing factor when picking a mortgage lender, that shouldn't be your only consideration. For example, the closing costs and other fees associated with a particular lender are possibly just as important, as they paint a clearer picture of what your actual costs will be. A mortgage has a long lasting effect on your financial life, as its terms typically last anywhere from 10 to 30 years. In order to make sure that this doesn't hamstring you, a financial advisor might be your best choice. The SmartAsset financial advisor matching tool can pair you with advisors in your area, based on your answers to a few simple questions about your situation.